Our Youth Delegation Coordinator, Heather Topcik, shares some of the highlights of the February delegation trip! 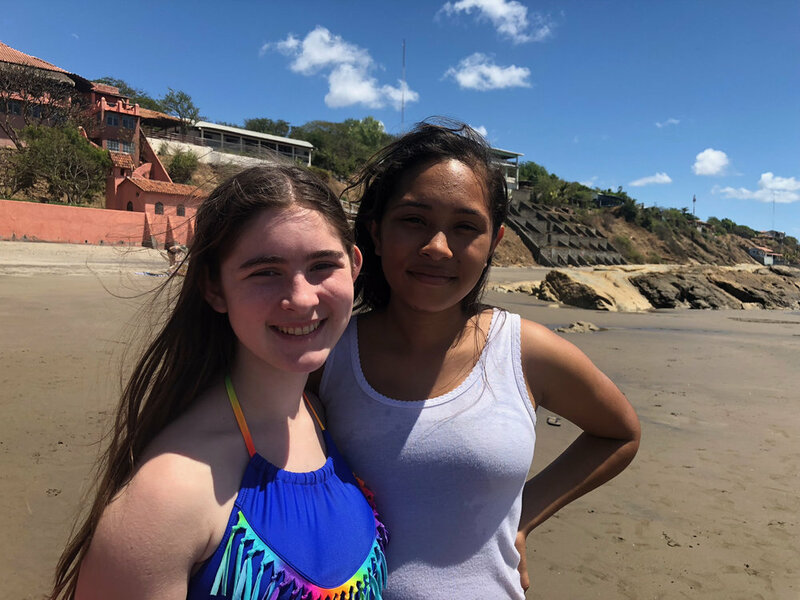 We went to the American Nicaraguan Foundation (ANF) to participate in the different workshops that the ArcoIris kids run for the surrounding community. We broke up into three groups: the sewing workshop taught how to sew simple cloth bags (many using pedal sewing machines! ); the woodworking group made large puzzles out of thick corrugated cardboard that will be used as teaching tools for developmentally disabled kids; and the "bio-dynamic" crew helped with the organic garden. (It is so dry here that each bed takes 8 cans of water, a process that took nearly all day. They are working on an irrigation system, but that will take a lot of time and effort.) There was even a group that got to put on "bee suits" and visit the bee hives that are the cornerstone of this whole enterprise. There are classes on the art and science of beekeeping, woodworking workshops on how to build the hives, and a lab teaching how to make products (creams, lip balms) out of beeswax, and to harvest honey to sell. We harvested some honey and ate it straight off the frame. It was really inspiring to see these AI kids doing their work -- they are all community leaders, or training to become one. We set out at 8:00 a.m. to paint the Chilamatillo library with a sealant to protect the adobe. It's a small building and we had all the kids working, so it didn't take very long. While trips like these are often described as "service trips,” the reality is that we aren't here to offer our superior woodworking and adobe skills! 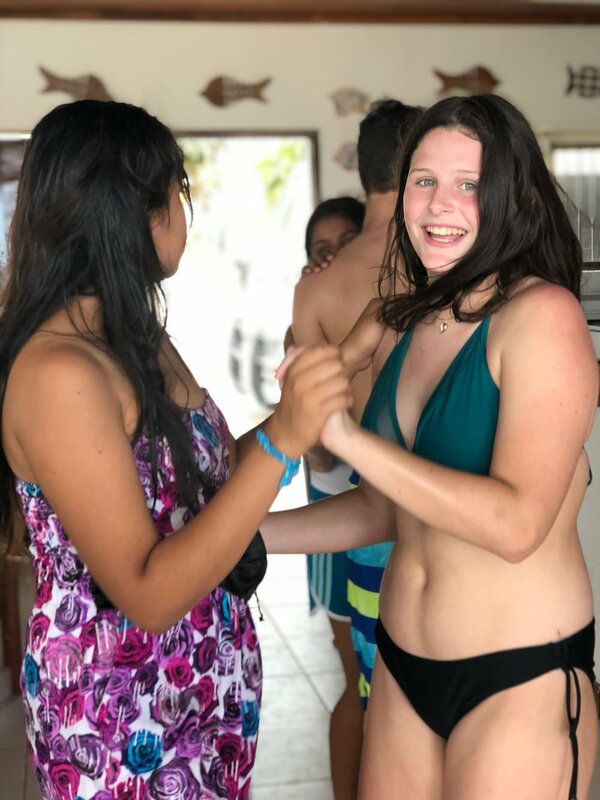 What happens here is much more profound: a sustained intercultural exchange where we are really learning about the grassroots community development projects that our ArcoIris counterparts work on every day. 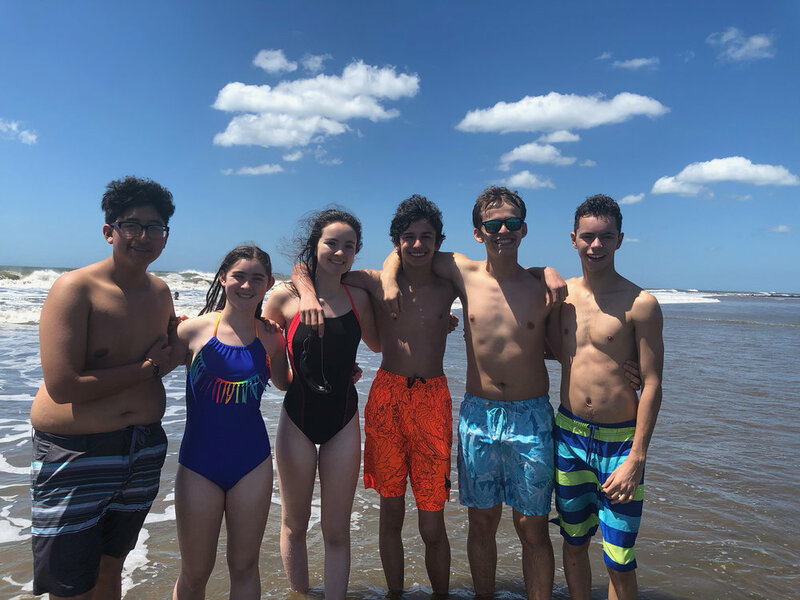 It is really inspiring to see these Nican kids develop the leadership skills that are making a difference, and finding ways that we can support them and learn from them. 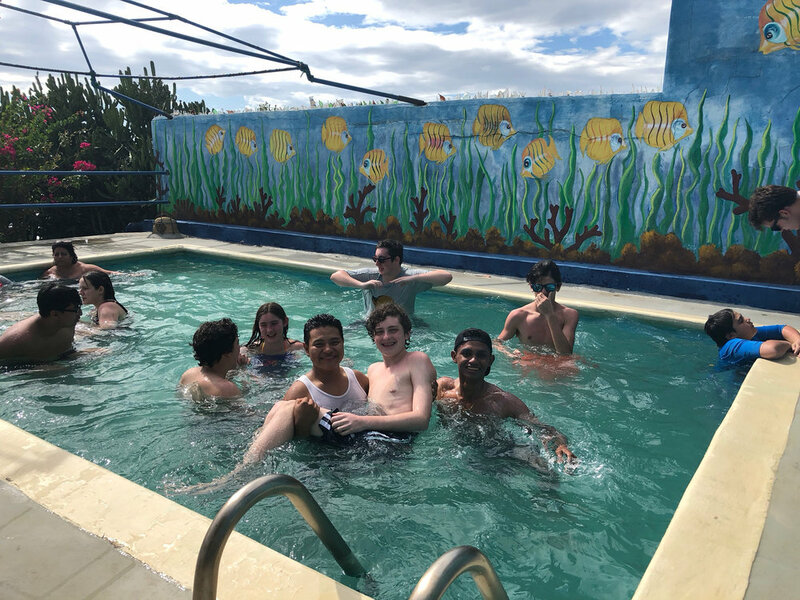 After a lunch of chicken, gallo pinto (a mixture of beans and rice that we eat at almost every meal) and tostones, we did our best to wash up at the school - this involved an untold number of baby wipes - and change our clothes to head to Granada for dinner. Going from Chilamatillo to Granada takes only about an hour, but is a completely different universe. Granada is an beautiful colonial city that hosts an International Poetry Festival each February. The last day was on Saturday, so it was particularly festive. We had a couple of hours to wander around the center of town. 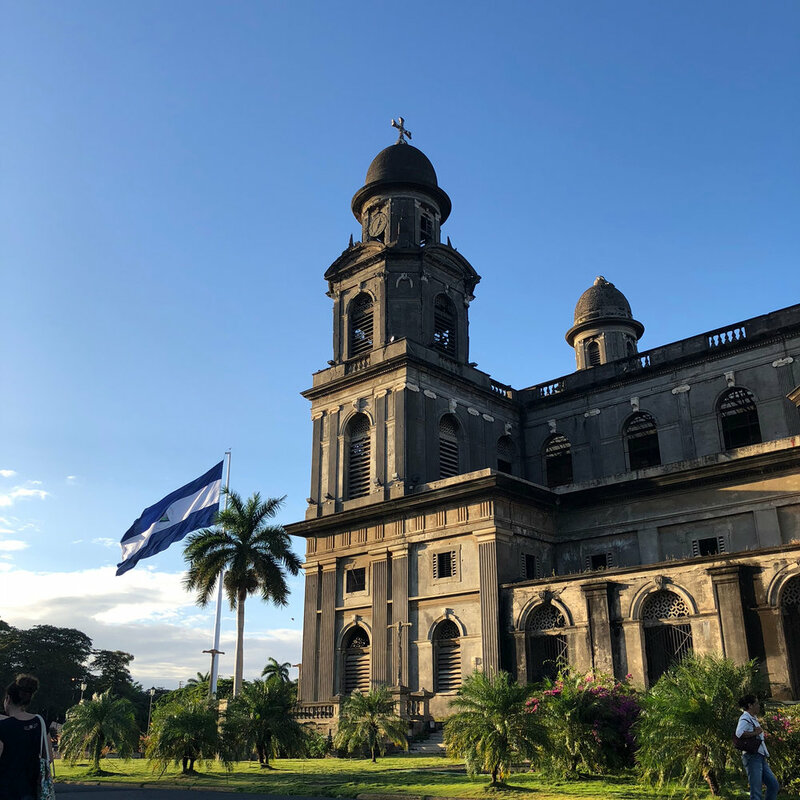 The kids all climbed the bell tower, we visited the craft market, and then had the good fortune to come across the sound check of one of Nicaragua's most famous and beloved singers, Carlos Mejia Godoy! We had front row seats to the rehearsal and it was fun to see all the locals taking selfies in front of the stage. This community of roughly 100 families (or about 1000 people) dug a well and organized to make it a communal enterprise. They have been working with Rosa Gomez (Dos Pueblos’ Program Coordinator, and a very skilled community organizer) for many years to develop this project -- just two years ago the well had a simple hand crank. We heard from women who had spent several hours a day pumping and transporting buckets of water to their homes. Now, the well has an electric pump, funded by the Dos Pueblos community. We’ve also planted trees around the pump house. In Phase Three of this project, the community will install a water tank that we already raised funds for - in November on Giving Tuesday - which will expand access to the water supply. One of the women talked about how unconvinced she was at the beginning of the water project, and that she was sure it would never work. She then took us to her home to show us that she had running water. It was a powerful moment, witnessing our collaboration at work! 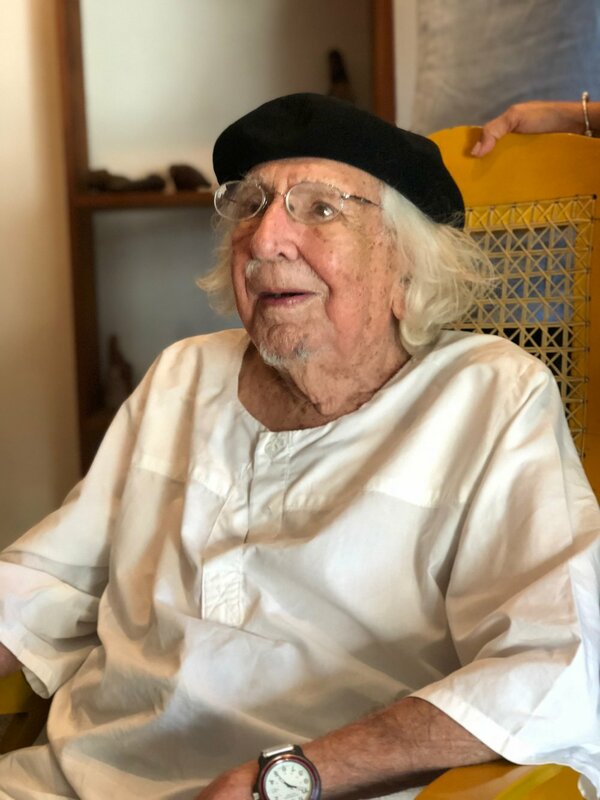 We drove into Managua where we had been invited to the home of Ernesto Cardenal, one of Nicaragua's most most famous poets who served as the Minister of Culture from 1979 - 1987. Our group originally learned about Cardenal when we visited an exhibition at NYU in New York on the community he formed in Solentiname in the 1960's. Cardenal was a priest and Solentiname was a contemplative and artistic community that felt compelled to take up arms against the Somoza regime in the revolution. He has remained an important voice in the political and cultural life of Nicaragua and at 93, is still active as a poet and sculptor. So we were thrilled to be invited to his home, where all 40 of us filed into his living room while he told us about his life, his poetry and answered questions.